Joe Louis, who held the heavyweight boxing championship of the world for almost 12 years and the affection of the American public for most of his adult life, died yesterday of cardiac arrest in Las Vegas, Nevada. He was 66 years old. Mr. Louis, who was champion from 1937 until 1949, collapsed in the bathroom of his home at approximately 9:30 A.M. (P.S.T.). Efforts by Noel Larimer, his personal therapist, and by paramedics to revive Mr. Louis were unsuccessful. He was pronounced dead at Desert Springs Hospital at 10:05 A.M. His wife, Martha, was with him at the hospital. Slow of foot but redeemingly fast of hands, Joe Louis dominated heavyweight boxing from 1937 to 1948. As world champion he defended his title 25 times, facing all challengers and fighting the best that the countries of the world could offer. In the opinion of many boxing experts, the plain, simple, unobtrusive Brown Bomber - as he was known - with his crushing left jab and hook, was probably the best heavyweight fighter of all time. The 6-foot-1 1/2-inch, 197-pound Louis won his title June 22, 1937, in Chicago, by knocking out James J. Braddock in eight rounds, thus becoming the first black heavyweight champion since Jack Johnson, who had reigned earlier in the century. Before Louis retired undefeated as champion on March 1, 1949, his last title defense had been against Jersey Joe Walcott. Louis knocked him out on June 25, 1948, in New York. As the titleholder, his fights had grossed more than $4.6 million, of which he received about $800,000. A fighter who wasted little time in dispatching his opponents, Louis's earnings per round were extraordinarily high. Of the 25 title defenses, only three went the full 15 rounds. Tony Galento, for example, survived four rounds in 1939, and Buddy Baer managed one round in 1942. Excluding exhibitions, Louis won 68 professional fights and lost only three. He scored 54 knockouts, including five in the first round. After retiring, he continued to appear in exhibitions and in 1950 he decided to make a comeback, but was beaten by Ezzard Charles in 15 rounds. His final professional bout took place on October 26, 1951, when he lost to Rocky Marciano in New York. His final competition, an exhibition, took place December 16, 1951, in Taipei against Corporal Buford J. DeCordova. The most spectacular victim of Louis's robust punches was Max Schmeling, the German fighter who was personally hailed by Adolf Hitler as a paragon of Teutonic manhood. Schmeling, who had knocked out Louis in 12 rounds in 1936, was given a return bout on June 22, 1938, in Yankee Stadium. He was knocked out in 2 minutes 4 seconds of the first round. Describing the bout in The New York Times, John Kieran wrote: ''Well, of all things! It's on and it's over. Just as Joe promised. He stepped in and started a lightning attack. Lefts and rights - Bang! Bang! Bang! Schmeling reeled into the ropes on the first-base side of the ring and clung like a shipwrecked soldier to a lifeline. Not all of Louis's fights were so savage. Many of his adversaries entered the ring already quaking and his task of finishing them off was thus a matter of a half dozen solid punches at the proper moment. There was no Joe Louis behind any facade. He was the same slowspoken, considerate person in a close social group as he was to the vast crowds that surged in on him to clutch his every word when he was at the apogee of the boxing world. A simple dignity was characteristic of Louis, who never pretended that his sharecropper origins in Alabama were more than humble. 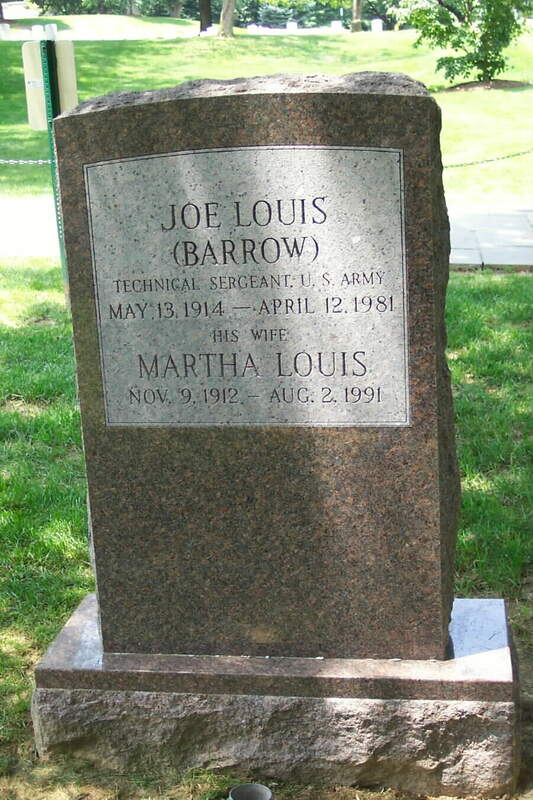 Louis was born Joseph Louis Barrow on May 13, 1914, in the cottonfield country near Lafayette, Alabama, the eighth child of Munn and Lilly Barrow. His boyhood was one of want and little schooling. In his teens, he did odd jobs to help his family until the they moved to Detroit. He worked as a laborer there in the River Rouge plant of the Ford Company. The future champion attended Bronson Vocational School for a time to learn cabinet-making, before turning to amateur boxing at the request of a schoolmate. He made his boxing debut in an amateur tournament in Detroit, where he was then making his home, as a lightheavyweight. He lost the decision, getting knocked down three times by Johnny Miler in a three-rounder. However, he persevered and, in 1934, won the national Amateur Athletic Union light-heavyweight title. That ended his career as an amateur. His record included 43 knockout victories in 54 bouts. On July 4, 1934, Louis appeared as a professional fighter for the first time and knocked out Jack Kracken in one round in Chicago. Much of Louis's success was due to the capable manner in which he was handled as a professional. His amateur record brought him to the attention of Julian Black and John Roxborough, who engaged the late Jack Blackburn, one of the ring's great competitors, to polish the rough spots in the young fighter's style and to get the maximum results out of his tremendous strength and punching power. Louis had 11 more fights in 1934 and 14 in 1935. By then his prowess had attracted the attention of Mike Jacobs in New York. Mr. Jacobs was competing against Madison Square Garden for the right to promote boxing. He went to Detroit to see Louis fight Natie Brown in March 1935. After outpointing Brown, Louis soon joined the New York promoter. On June 25, 1935, Louis appeared for the first time before New York fans and was an immediate success, knocking out Primo Carnera in six rounds. He was so impressive that fans clamored for a match between him and Max Baer. Baer had lost the heavyweight championship to Braddock only two weeks before Louis stopped Carnera. Louis and Baer met on Sept. 24 of that year, and the young fighter, already recognized as a punching machine, pounded Baer into helplessness in four rounds. Altogether Louis had 14 bouts in 1935 and earned a total of $368,037, an almost incredible sum then for a fighter in his second year as a professional. On June 19, 1936, Louis had his first meeting with Schmeling in New York and suffered his first professional defeat, a 12th-round knockout. Schmeling told reporters before the bout that he had seen faults in Louis's style. After the bout, Schmeling disclosed that Louis had a habit of lowering his left shoulder and arm, leaving his chin open for a right-hand counter punch. Schmeling floored Louis with that weapon in the fourth round, and finally knocked him out with more of the right-hand blows in the 12th. Schmeling was promised a title bout against Braddock after he stopped Louis, but Mr. Jacobs wanted Louis to get the chance. After stalling Schmeling, Braddock agreed to meet Louis. They fought in Chicago and Louis knocked out Braddock in the eighth round to win the heavyweight title. In 1938 the new champion had only three bouts, but one of those was his second against Schmeling. Germany was then expounding its superman propaganda to the world, and Hitler had made it known that Schmeling was one of those supermen. Schmeling made the mistake of believing Hitler and made some disparaging remarks about Americans in general and blacks in particular. When Louis and the challenger met on June 22, 1938, in New York, the champion was in a rage. Louis cut his opponent down with terrific head and body punches. Schmeling went to a local hospital to recuperate before he returned to Germany. The 2-minute-4-second time span was a record for turning back a challenger in a heavyweight title bout. The bout was the first million-dollar gate Louis attracted during his career. After that Louis had things pretty much his own way in the ring. Tony Galento had him on the canvas briefly in 1939, Arturo Godoy's crouching nose-to-the-floor tactics puzzled Louis the full 15 rounds in 1940, and Buddy Baer, brother of Max, knocked Louis out of the ring for a nine-count in 1941 before losing. That last event came during Louis's so-called ''bum-of-the-month campaign.'' During it, beginning in December 1940, he met challengers at the rate of one a month, a performance that no other heavyweight champion ever attempted. Louis came close to losing his crown in the first fight with Billy Conn of Pittsburgh on June 18, 1941, at the Polo Grounds. Conn, the light-heavyweight king, relinquished his title to meet Louis. For 12 rounds Louis received a lesson in boxing from the stylish challenger. However, in the 13th, Conn dropped his successful tactics and attempted to slug it out with Louis. The move cost him the championship. Louis knocked him out with two seconds left in the round. Three months later Louis stopped Lou Nova, and in January 1942, he defeated Buddy Baer again, in 2:56 of the first round. That bout in Madison Square Garden was for the Navy Relief Society, which received $47,000. Two months later Louis knocked out Abe Simon in the sixth round of a fight in New York. The Army Relief society gained by $36,146. Louis then went into the Army as a private. As a soldier, Louis traveled more than 21,000 miles and staged 96 boxing exhibitions before two million soldiers. Louis came out of the Army on Oct. 1, 1945, and shortly after signed to defend his title against Conn. The bout was the second million-dollar gate Louis drew and earned him the largest purse of his career, $625,916.44. The champion stopped Conn in the eighth round at Yankee Stadium on June 19, 1946. The champion defended his title three more times after the Conn fight, knocking out Tami Mauriello and Jersey Joe Walcott twice. After the second Walcott bout on June 25, 1948, Louis retired - officially on March 1, 1949. He later tried a comeback but failed to regain his championship form. Ezzard Charles outpointed him in 15 rounds at Yankee Stadium on Sept. 27, 1950. A year later Louis's ring career came to an end when Rocky Marciano knocked him out in the eighth round of their bout at Madison Square Garden on October 26, 1951. Although he made a lot of money, it passed through his fingers quickly - and without the sort of accounting that the Internal Revenue Service expects. As a result, the Government calculated that his delinquent taxes - after penalties and interest - amounted to $1.25 million, a sum that Louis found staggering. ''I liked the good life,'' Louis said. ''I just don't know where the money went. I wish I did. I got 50 percent of each purse and all kinds of expenses came out of my cut.'' In the mid-1960's, an accommodation was reached with the Government and the boxer was able to pay off his obligations. Louis was not officially forgiven by the tax collectors, but attempts at getting the money he owed ceased, according to a close friend of the boxer. Out of the ring for good, Louis tried to establish himself in a variety of careers. He wrestled briefly and engaged in various sports and commercial promotions. 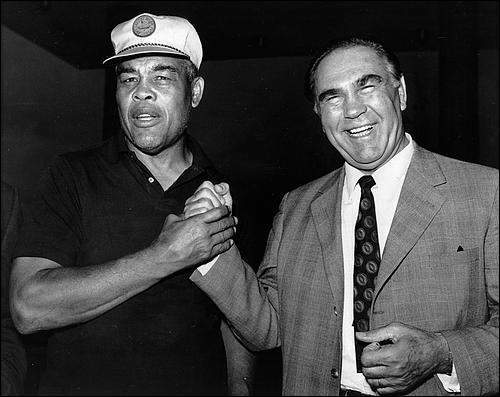 In 1969, he and Billy Conn, who had lost twice to Louis in title fights, set up the Joe Louis Food Franchise Corporation in the hope of operating an inter-racial chain of food shops. And in 1970, he spent five months at the Colorado Psychiatric Hospital and the Veterans Administration Hospital in Denver. He was hospitalized by his wife, Martha, and his son, Joe Louis Barrow Jr., suffering from paranoia. Because of his confinement he was unable to attend a tribute to him in Detroit that was attended by more than 8,000 people. Louis disclosed the truth about some of his problems in 1971 in a book, ''Brown Bomber, The Pilgrimage of Joe Louis,'' by Barney Nagler. He said that his collapse in 1969 had been caused by cocaine. And he admitted that his hospitalization had been prompted by his fear of a plot to destroy him. In 1974 he took time off from his job as a ''greeter'' at Caesars Palace in Las Vegas, Nev., to referee the heavyweight fight between Joe Frazier and Jerry Quarry, proclaiming Frazier the winner after the fifth round because of heavy cuts on Quarry's face. Mr. Louis and Marva Trotter, a 19-year-old Chicago secretary, were married on September 24, 1935. The marriage took place in a Harlem apartment just a few hours before Louis stepped into the ring and knocked out Max Baer. The couple were divorced in March 1945, but remarried a year later. They were divorced a second time in February 1949. A daughter, Jacquelin, was born to the couple on February 8, 1943, and a son, Joe Jr., on May 28, 1947. Mr. Louis's third marriage was to Rose Morgan, a New York cosmetics manufacturer, on Christmas Day, 1955. His fourth marriage was to Mrs. Martha Jackson, a Los Angeles lawyer. It took place March 17, 1959, after his union with Rose Morgan Louis was terminated by annulment. Since 1977, Mr. Louis had been confined to a wheelchair following surgery to correct an aortic aneurysm. His health over the last decade had been poor, beset with heart problems, emotional disorders and strokes. An electronic pacemaker was implanted near his heart last December 23 in Houston. A spokesman for the Louis family said that the former champion's body would lie in state on Thursday at Caesars Palace. Burial will be on Friday morning at a burial site yet to be determined. Born in Lexington, Alabama, May 13, 1914, he was the World Heavyweight Champion of the world from 1937 to 1949. He served with the Army in World War II, mostly performing in boxing matches at military installations around the world in a morale-improving program. After losing his boxing title, he served as a greeter at Caesar's Palace in Las Vegas. He did not technically qualify for burial in Arlington National Cemtery, but President Ronald Reagan waived the requirements and he was buried in Section 7-A, near the Tomb of the Unknowns, following his death on April 12, 1981. I was privileged and will always be grateful to have had Joe Louis as my friend. The son of an Alabama sharecropper, Joe Louis fought his way to the top of professional boxing and into the hearts of millions of Americans. Out of the ring, he was a considerate and soft-spoken man; inside the ring, his courage, strength, and consummate skill wrote a unique and unforgettable chapter in sports history. But Joe Louis was more than a sports legend -- his career was an indictment of racial bigotry and a source of pride and inspiration to millions of white and black people around the world. All of America mourns his loss, and we convey our sympathy to his family and friends. But we also share their pride in his professional achievements, his service to his country, and his strength of heart and spirit. 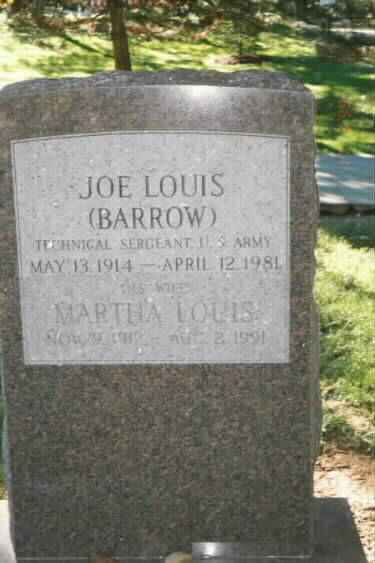 Note: On April 16 the White House announced that at the request of Mrs. Louis, the President waived the burial requirements for Arlington National Cemetery to allow Joe Louis to be buried there. Heavyweight boxing champion Joe Louis was only 24 when he was cast as the defender of freedom and democracy in a symbolic struggle against the Nazis and their theories of racial superiority. A&E Network's profile of Louis, nicknamed the "Brown Bomber," premieres Thursday at 8 p.m.
Born in the South, Louis grew up in Detroit. Of his 71 career fights, he is most remembered for two. In 1936, as a newcomer, he was defeated by former champion Max Schmeling, a German. But in 1938, when Louis was champion, he held onto the title he had won from James Braddock with a first-round knockout of Schmeling in a highly publicized bout in New York, debunking Adolph Hitler's boast of racial superiority. Louis was the champ of the ring from 1937 to 1949. Louis served in the Army during World War II, mostly fighting exhibition matches. He later went through a long struggle with the Internal Revenue Service over back taxes, a debt that was settled before he died in 1981. He is buried in Arlington National Cemetery under a stately tombstone. This story is about heavyweight boxing champion Joe Louis. It was sent to me during the 1980s by Ruth Ford of Las Vegas. Ford’s mother was Naomi Zeller of Lebanon RD 3. Ford, who grew up in Schaefferstown, was the boxing champ’s private nurse for a number of years. 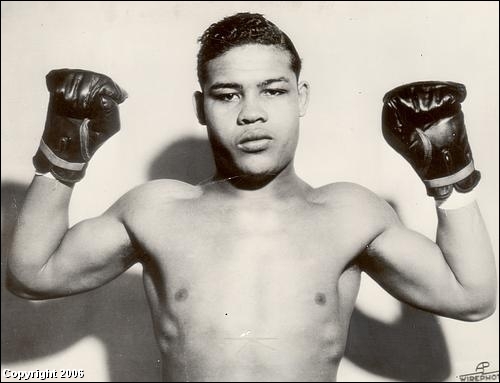 Louis, born Joe Louis Barrow, died of cardiac arrest on Sunday, April 12, 1981, at Desert Springs Hospital in Las Vegas. He was 66. The night before, Louis had watched from ringside as Larry Holmes successfully defend his World Boxing Council heavyweight title against Trevor Berbick at Caesars Palace Sports Pavilion and was looking forward to seeing Diana Ross perform at the casino the next day. 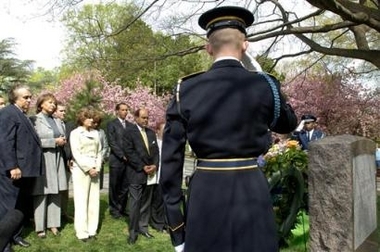 Louis was buried close to the Tomb of the Unknown Soldier in Arlington National Cemetery with President Reagan’s permission. Active pallbearers were entertainer Frank Sinatra, Caesars Palace president Harry Ward and heavyweight boxing champions Muhammad Ali and Larry Holmes. The honorary pallbearers included such boxing greats as Gene Tunney, Max Schmeling, Jack Dempsey, Sugar Ray Robinson, Floyd Patterson and Lou Nova and boxing promoter Don King. The gravesite is in Section 7A, below the Tomb of the Unknowns, in Arlington National Cemetery. 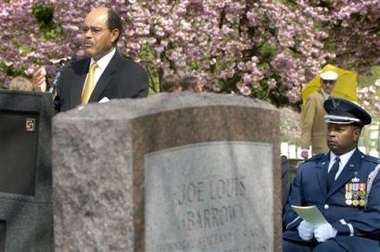 That's where Joe Barrow will be at 10:30 a.m. on April 12 when a wreath is laid upon the grave of his father, the legendary heavyweight champion, Joe Louis. For Barrow, executive director of the First Tee, it is fitting and important that the city of Detroit, where the Champ grew up, remembers to acknowledge the 25th anniversary of the Brown Bomber's death. Louis died on April 12, 1981, in Las Vegas. He was born in Alabama, raised in Detroit and became the world heavyweight champion in 1937. He held the title until 1949, a record 11 years, eight months. Louis -- his full name was Joe Louis Barrow -- defended his title a record 25 times. "There are two places that my father has always recognized -- one is growing up as a sharecropper in Chambers County, Alabama, and the other is Detroit," Barrow said. "Of the two, Joe Louis clearly identified with Detroit. Detroit continues to be, without a doubt, the place where Joe Louis grew up and started his career. "That's a special connection that will not go away. He lived in a lot of cities but he's always referred to as Joe Louis of Detroit, Michigan." In his travels, Barrow hears so much about Detroit as his father's home. "In that regard, whenever I meet people from Detroit and they find out who I am, they always refer to the Joe, the monument and how important he was to Detroit," Barrow said. "I think it would be nice if, on April 12, the city was to take a moment to talk about Joe Louis and who he was -- in the schools, on sports talk radio, and the media to take a moment to do a retrospective on what he meant to the country and the world, to reflect on the depth of his impact." The memory and accomplishments of Joe Louis are everlasting in Detroit -- with Joe Louis Arena and The Fist at Hart Plaza. Joe Louis began his boxing career as an amateur at the old Brewster Recreation Center, since renamed Wheeler. And he was involved in one of the most memorable sporting events in history. A first-round knockout over the German Max Schmeling was regarded as a victory for the free world over Hitler's Nazi Germany. That fight, his career, and life are worth remembering.